Addis Ababa, 29th November 2018 : The African Union (AU) Commission and the United States of America convened the 6th annual High Level Dialogue at the African Union Headquarters, Addis Ababa. Led by the African Union Commission Deputy Chairperson Amb. Kwesi Quartey and the Assistant Secretary of State for African Affairs Tibor Nagy, both sides reaffirmed their commitment to strengthen African regional integration and enhance cooperation and synergy in advancing efforts towards stability and sustainable economic development in Africa, centered on mutual interest and shared values. The High Level Dialogue is an opportunity for the AU Commission and the U.S. to review progress on the implementation in the various aspects of cooperation under the four pillars of the AUC-U.S. Partnership in the areas of peace and security; economic growth, trade and investment; democracy and governance; and promoting investment opportunities and development. The cooperation is aligned with the African Union development framework, Agenda 2063. The U.S. affirmed its support to the African Continental Free Trade Area (AfCFTA) while acknowledging the progress attained on its establishment. Since March 2018, 49 Member States of the African Union have signed the Agreement establishing the AfCFTA; 12 have ratified it. The U.S. also pledged to enhance discussion on how to complement and support the AfCFTA. 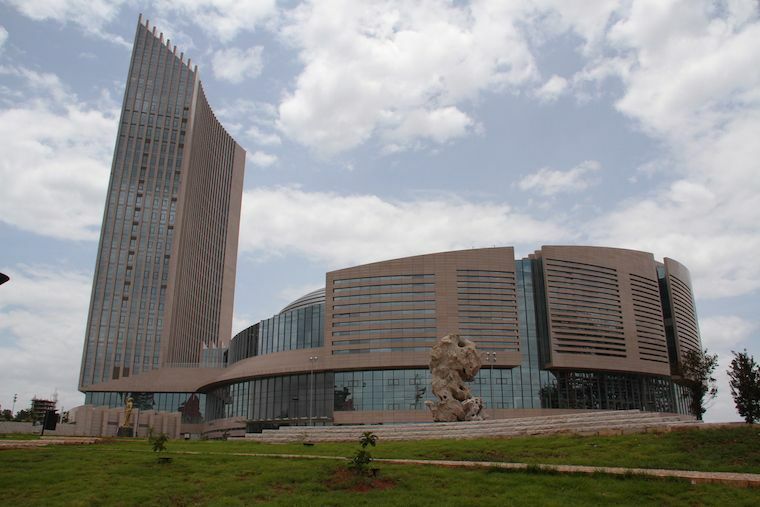 The African Union Commission welcomes the Congressional passage of the Better Utilization of Investments Leading to Development (BUILD) Act, which will deploy new development finance instruments, including expanding the lending limit to USD 60 billion. Since October 2017, USD 869 million of Overseas Private Investment Corporation investment has catalyzed USD 2.12 billion in private sector investment.. The African Union Commission also welcomes the Millennium Challenge Corporation Modernization Act, to promote regional integration, trade, and economic growth. In addition, the United States noted that the Connect Africa Initiative, launched in July 2018, seeks to invest one billion USD over the next two years in the areas of information and communications technology; value chains; and transportation and logistics. The AU highlighted efforts to encourage transformative investments for women, including a fund for women in business. Both sides agreed on the value of convening an annual forum for trade and investment to bring together the U.S. and African private sectors to promote investment and expand African Growth and Opportunity Act (AGOA) implementation at the regional and continental levels. Both sides agreed to deepen collaboration to advance peace and security. The AU Commission briefed on the AU Peace Fund, noting that Member States have contributed approximately USD 60 million to the Fund, the highest amount since the establishment of the Peace Fund in 1993. The Peace Fund finances mediation and preventive diplomacy, institutional capacity building and peace support operations. The two sides recognized the sacrifices and contributions of African peacekeepers, and the ongoing efforts by the AU in upholding standards for human rights and conduct, ensuring financial transparency, and ensuring accountability. The two sides agreed to strengthen support for the stabilization process in Somalia as well as the conditions based-exit strategy of AMISOM, as part of the Somalia Transition Plan. In the same context, the leaders also committed to continue support for the Multi National Joint Task Force (MNJTF) against Boko Haram and the G5 Sahel force to become effective in tackling the security challenges facing the Sahel region. To counter transnational threats, the two sides agreed to increase collaboration including on combating terrorism, violent extremism, and radicalization, building on the advances of the annual U.S.-AU Countering Violent Extremism Week. Both highlighted the importance of curbing illicit arms and financial flows, which continue to fuel conflict in Africa. They also underscored the nexus between peace, security, governance and development. Africa’s renewed efforts to fight corruption, strengthen democratic institutions and good governance were also discussed. The two sides acknowledged the progress to prevent and combat corruption in Africa, as well as the ongoing work under the 2018 AU theme of the year “Winning the fight against corruption: a sustainable path to Africa’s transformation”. In the same context, the two sides welcomed the critical work of AU’s Democracy and Electoral Assistance Unit in support of the conduct of transparent electoral processes in line with the relevant AU instruments. Both sides lauded the outcomes of the recent Extraordinary Summit on AU Reform, which instills ownership by Member States and greater efficiency. The U.S. and the AU look forward to operationalization of the Hybrid Court for South Sudan to promote accountability. Both sides committed to strengthening democratic institutions as the bedrock to promote good governance, constitutionalism and rule of law as well as promotion and protection of human rights. The two sides exchanged views on cooperation on youth empowerment, leadership development and entrepreneurship initiatives. Both leaders commended the work of the AU Commission in the successful recruitment, training and deployment of the 9th cohort of African Union Youth Volunteer Corps (AU-YVC) comprising 208 young Africans, 56% of whom are female. To advance investment opportunity and development in Africa, the delegations emphasized the importance of expanding professional opportunities for young people through programs such as the Young African Leaders Initiative (YALI). Both delegations discussed the significant progress achieved in the reduction of maternal and child mortality rates, promotion of gender equality and women’s empowerment, advancing the women, peace and security agenda in Africa, and collaboration on public health. The AU also highlighted Assembly Decision 635 on achieving full gender parity and 35% youth representation by 2025 as well as the new AU strategy on gender equality and women’s empowerment to fast track progress. Both sides agreed on the need to involve the African Union Development Agency (AUDA)/NEPAD Planning and Coordinating Agency (NPCA) in the African Capacity Building Foundation (ACBF) and the African diaspora in the AUC-U.S. High-Level Dialogue. The two sides also agreed to develop a mechanism to involve the Regional Economic Communities (RECs) in the High-Level Dialogue and propose a structure to promote interactions between the African and U.S. private sectors. The two sides reaffirmed their commitment to the Africa Centers for Disease Control (Africa CDC) and Prevention and to enhance cooperation in surveillance, emergency preparedness and response, laboratory systems, information systems, and workforce development. Africa CDC has made commendable contributions, including technical support to Member States in response to outbreaks of infectious diseases. The African Union’s efforts to mitigate the effects of fall armyworm on agricultural productivity under the Comprehensive Africa Agricultural Development Program (CAADP), was acknowledged, as well as its plans to promote food safety. Furthermore, both sides committed to enhancing cybersecurity collaboration and protection of intellectual property rights at the continental level, building on relevant AU instruments including the Protocol on Cybersecurity and Data Protection.